Add the whole wheat flour, rolled oats, baking soda and salt to a large bowl and whisk to combine. 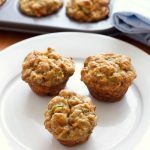 Drop about a tablespoon of the muffin batter into each of the prepared muffin cups and bake at 350 degrees for about 15-18 minutes or until the muffins are a nice golden brown. This recipe makes about 30 mini muffins, but I usually make 24 mini muffins for the kids and 3 regular sized muffins for my husband and I to enjoy.